On the receiving end, I had hellfire and brimstone rained down on me. I was driving on a holiday in Texas and I messed the priorities at a junction. The guy blasted his horn, sped up to pass me and brandished a cross that he had hanging from his mirror!. He then glowered at me instead of looking where he was going then pulled right in front of my nose forcing me to brake. I'd have been pretty p!ssed off if I could have believed what I saw! He obviously thought you were a vampire. "I can't believe they let those guys drive in the day time! " It seems more along the lines of: "The Power of Christ compels you!" Lol! His passenger probably said "Show him you're cross..."
Why, one asks, are these two young persons wearing their trousers back to front? Is it because they are backward in other respects, or is it some strange recognition symbol between certain members of the youth of the Excited States? Come to think of it, their tailor made a mess of their leg measurements too. They were kid-rappers back in the early 90s that made music that appealed to children. Songs about things like missing the school bus and being in trouble for it, etc. Their gimmick was that they wore their clothes backwards. The clothes themselves, however, were the actual style of the time among "urban" yoots; baggy, oversized, and often featuring sports team stuff (just... not backwards). 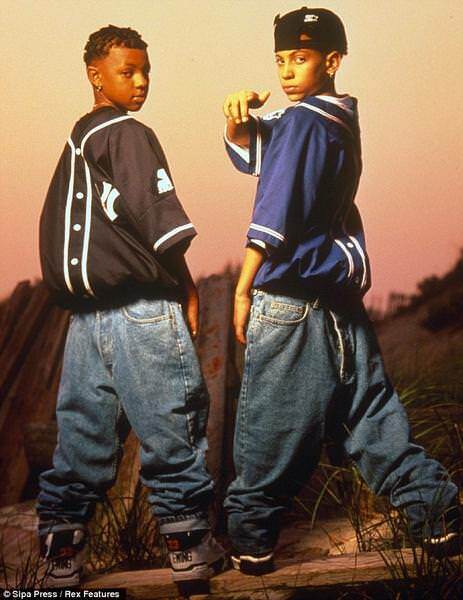 EDIT: Ooops, I forgot .... the relevance: Their name is "Kriss Kross." Might have heard of one of their songs, that goes like, "Kriss Kross will make you jump!" He then sped up to cross in front me. Whole load of judgement heading my way! One of my best buddies at work got into racing a few years ago. He's on his way to China this week for a race, but here are some videos form a race he want to in Thailand last November. He raced at Reno this year too, taking third in class. I believe the people who run the Formula 1 Air Racing tour are also working on an electric Air Racing class. Electric power has come a long way in the last few years. I'm half tempted to take my "antique" Airfix Mk.IX Spitfire and doing something racing oriented with it. It's almost as if we should do a crappy kit group build next, lol! Right gents. Your gracious Moderators have agreed to an extension of 14 days being issued for the GB. Therefore the GB will now finish on 14th February, Valentines Day. Sadly I fear I have to bail. Had hoped to get my entry done by the 14th but that's looking highly unlikely. Mum in and out of hospital end of last week so Up North for a few days. Will plod on with the build when I get back. Sorry to hear that KB.